So looky there guys, that bowl on the left is the bubbly little critter that I've been feeding twice daily for the past six days or so and will now go into semi-hibernation in my fridge until it's needed again. The mother-starter, as it were, or the "barm." 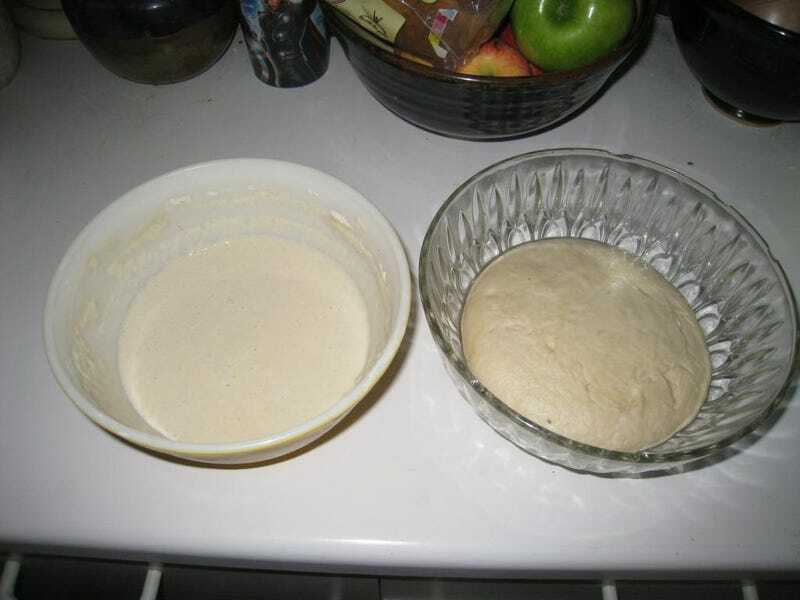 On the right is the "dry starter" that's the first step in the sourdough baking process, made by mixing 2/3rds of a cup of the wet stuff with 1 cup bread flour and a little bit of extra water until it's firm but slightly sticky. That one's been fermenting at room temperature for four hours, and will soon go into the fridge for a little cooling fermentation-retardation, to stew in its own sour juices overnight. Tomorrow I'll use the dry starter to make the dough proper—more flour, water and salt—and that too will go into the fridge overnight to give the yeasties some nice slow time to build up that sourness I crave. The current plan is to bake one large loaf in a Dutch oven and to use the other half of the dough to shape two free-standing boules. Or maybe one boule and one torpedo, I haven't quite decided. I may poll the cats. Tuesday: BAKING DAY. Also: EATING FRESH SOURDOUGH SLATHERED IN BUTTER DAY.